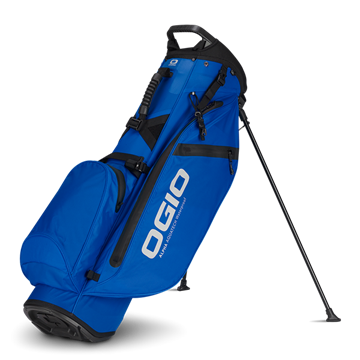 Ogio Alpha Aquatech stand bags are lightweight and waterproof. They protect your clubs and valuables as well as being comfortable to carry. Smart looking design in all black with a silver logo. Ogio Alpha Aquatech stand bags are lightweight and waterproof. They protect your clubs and valuables as well as being comfortable to carry. Lovely colour scheme, with a vibrant shade of blue with black trim. Ogio Alpha Aquatech stand bags are lightweight and waterproof. They protect your clubs and valuables as well as being comfortable to carry. Light colour scheme in grey with black trim. 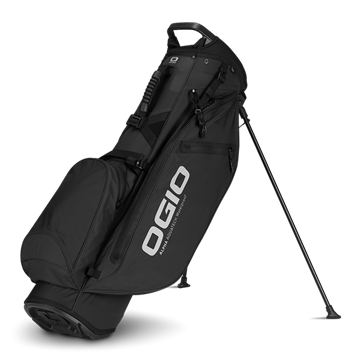 Ogio Alpha Aquatech stand bags are lightweight and waterproof. They protect your clubs and valuables as well as being comfortable to carry. Brightly coloured in red with black trim. Lightweight, comfortable and waterproof. With a double strap for ease of carrying.